What is the purpose of BlephEx? 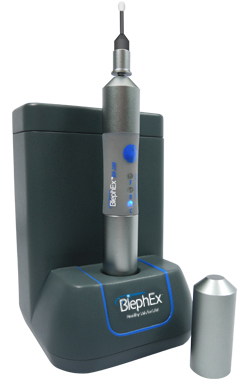 BlephEx has been developed to treat Blepharitis. Blepharitis is the inflammation of the eyelids due to the overgrowth of bacteria along the lid margins. By using a microscope, we can take a photo of your eyelashes to show you the blepharitis. Blepharitis is a vicious cycle if it is not detected and treated properly. As we start to age, our bodies are unable to make sufficient natural antibodies in our tears, resulting in the overgrowth of normal bacteria on our lid margins. Exotoxins and endotoxins are produced by the bacteria, causing inflammation to occur along the lid margins. This inflammation affects our tear glands, causing a decrease in tear and antibodies production, resulting in the increase in growth of bacteria, and the vicious cycle repeats itself. Blepharitis is the inflammation of the eyelids, in which the eyelids become red, itchy and irritated. This is due to the overgrowth of bacteria along the lid margins. It can affect people of all ages. By using a microscope, we can take a photo of your eyelashes to show you the blepharitis. Crusting of the eyelids , also known as "bak sai" or "yan shi" is a common symptom seen in people suffering from blepharitis. 1) Anterior blepharitis: Occurs at the front surface of the lid margin, at the root of the eyelashes. 2) Posterior blepharitis: Occurs on the inner lid margin that touches the eyeball. Knowing the definition of blepharitis helps us to understand why eyelash extensions is a cause of it. Eyelash extensions are being glued onto the eye, thus making it harder to clean them thoroughly. Washing your face every night and using of lid wipe is important as a daily hygiene routine. However, they are unable to ensure that lid hygiene has been maintained, as there are bound to have many small spaces that have been missed out during the cleaning process. This is the chance for bacteria and demodex (mites that lives in our eyelash follicles) to grow, toxins are produced which then causes inflammation of our eyelashes (blepharitis). 1) Anterior blepharitis is mostly caused by bacteria (staphylococcus aureus), or overreactive sebaceous glands. 2) Posterior blepharitis is caused by the irregular secretion of oil from glands in the eyelids known as the meibomian glands. This creates an optimal environment for the bacteria to reproduce and multiply. Demodex is a type of tiny mite that lives in our eyelash follicles. Demodex's main source of food is the oil secreted by our sebaceous glands. Research has shown that 44% of blepharitis patients have demodex in their eyelash follicles, with the increase in numbers as we get older. It is therefore important to find and treat the root cause of the problem. What are the treatment methods for blepharitis? "Blepharitis is a common cause of redness, itchiness and allergies. It is often overlooked. Now, there is BLEPHEX that treats it easily." It is a painless procedure that uses a medical grade micro sponge that spins thoroughly and carefully along your upper and lower lid margins to remove excess bacteria, biofilm and toxins from your lids and lashes. The micro-sponge is disposable and is changed after cleaning each eye to ensure that hygiene is well kept. You will be taught on lid hygiene after the treatment, to prevent blepharitis from occuring.